Knight Runner: Marathon Challenge.. Let's do it! Marathon Challenge.. Let's do it! It's been a month since my last blog as It was a busy month with all the preparations on our upcoming strategic planning in early December. After the QCIM, I have mentioned that my ITBS came back and suspected that a shin splints is developing. Obviously I was so frustrated as injury keeps on coming at me. A day after the QCIM, my best friend Jay gave me a call just to tell me that I can still do the full marathon (given that I had an on and off training). The call was just to remind me to stay focused and believe that I can still make it (maybe he sensed that I was in the brink of giving up the Marathon). Yup, you read it right, a Full Marathon, crazy huh? I will be participating in the 2009 Standard Chartered Bangkok Marathon in Nov. 22. Will write about this later. Meanwhile, for the past month, I have been nursing my injury, went to a sports doctor and had my knee and leg checked. Three injury hit me, ITBS, shin splints, and a pulled hamstring. I was advised to undergo Physical Therapy with the following procedures; Electrical simulation, deep ultrasound, stretching, hot compress and strength training. In between my therapy, I am doing a cross training using my bike to keep me fit and catch up with the lost run training. I am using a ratio of 1:3.5 (1 km run = 3.5 km ride), to still get the mileage in terms of cardio fitness. I was determined to get well so I strictly followed the procedure and even do the stretching and strength training at home. Pressure was heating up as the marathon date is coming near. But I just simply focused and believed that I will get better. Two weeks after, I did a test run and luckily I finished 8km without much pain. It got me motivated to and stayed focus on the healing process. Then on the same week, I did a 16km long run injury free! Still went on with the therapy and hopefully I can conquer the marathon challenge. Given that I did not earn much mileage in my run, I was hoping that the cross training would help in terms of endurance. Confidence and a strong will is keeping me focused, I hope this can compensate with my physical weakness. Let see what happens next..
Good luck on the healing & recovery! good luck on your training. but take it easy. don't be like me who is hard-headed. however, you are still young and your body system has a faster healing process than mine..hehehe. i know you can make it to finish the full marathon. @ daytripper - look for Dr. Miguel Valencia of Asian Hospital. The therapy session was effective. @ Bald Runner - Thank you very much.. I finished my 1st Marathon Today. I joined the bangkok international marathon.. I remember how you paced in QCIM, you stick to your plan, and I was using that as a strategy, but like you i was hard headed also.. I tend to increase my pace din. 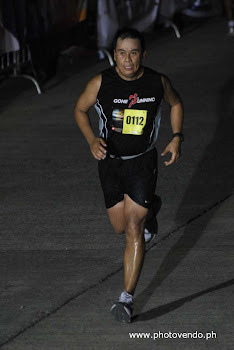 I was lucky though my therapy is not yet complete, my injury did not stop me to finish.. I did a walk run strategy.. Now, my ITB (left side) is painful, i still have 3 remaining therapy sessions hope it gets better soon.. This time I will make sure i rest.. I will write my marathon story later..